It should go without saying that most people are intuitively opposed to violence. In most cases, people would like nothing less than to go about their daily business without interruption. It is from this principle that various "libertarian capitalists" developed an ethical system called "the non-aggression principle", whereby all "aggression" is defined as a unethical. "Aggression" is defined in this context as the initiation of force against persons or property, and allows for protective self-defense under these circumstances. It is explicitly deontological in its orientation, that is, arguing that all aggression, so-defined, is wrong . As an attempt to shore-up the position, similar historical references from classical liberalism are often invoked . There are plentiful arguments against the NAP which will be outlined here. Firstly, is issue of subjective property and personal space assertions. Secondly, there is the issues that arise from a lack of proportionality in the "self-defense" clause. Thirdly, there is consequentialist issues which make the de-ontological approach ethically absurd. In addition to these there are ethical situations which make NAP impossible. In addition to these, there is similar pacifistic approaches which also subject to similar criticisms and by which comparison is worthwhile. In recognising these issues, an initial sketch of an alternative is posited which incorporates consequentialist and utilitan ethics. The first problem with the NAP is that it based on subjective claims of rights to property and personal space, but claims an objective response ("self-defense") when these rights are transgressed. A capitalist claims different property rights to a socialist, a landlord claims different property rights to a communalist, and so forth. Which of these is right? In a sense it doesn't matter, because unless a property claim is universally accepted, then the violation of property rights becomes moot. For the socialist, the capitalist engages in violence every time they make a profit, for the communualist, every time the landlord extracts rent, etc, and more to the point that they consider these these expropriations were prior initiations of violence. Claims that the individuals concerned accepted the wage or rent "by choice" are not really valid either, as voluntaristic claims in what they percieve as a "Hobson's Choice" environment are not justifications to the person's affected. Would the capitalist or landlord accept a "self-defense" argument when they try to claim their surplus value or rent? Probably not - but that their subjective assertion of property rights as well. As one Reditter, dietsodaworks, pointed out subjective assertions to property rights end up being a circular argument . You claim you don't use aggression. You define aggression as the initiation of force. You then define the initiation of force as using force to implement and maintain all property systems except your own. Therefore, you conclude you don't use aggression. Whilst this relates to matters of political economy, some people on the "propertarian" side of politics have noticed that subjectivism is a problem in the matter of individual assessments of rights, such as abortion. Some propertians will claim that a fetus is not a person and the decision for abortion comes down to the individual mother, and preventing her from acquiring such a medical procedure is a violation of the NAP. Others will claim that that a fetus has intrinsic rights independent of the mother and that an abortion is a violation of the fetus' rights. We may note of course that such advocates have never suggested that it can have them outside of her body then and nor have they offered to take care of the little darlings. Subjectivism also plagues the matter of proportionality. After all, if there is no objective standard on which harm is claimed in the first place, it follows that the degree of harm and the response is likewise a matter of subjectivity. As if often joked, in typical bad taste by NAP advocates, "if you scratch my arm you'll get a McNuke (TM) in response". This may be a joke response, but it underlies a real issue with the lack of an in-built sense of proportional response where the old-style signage "Trespassers will be shot" becomes a morally justifiable claim. It is a ludicrious notion of "aggression" which doesn't accept that this exists as a matter of degrees, nor does it take into account future estimations of violence. If one has a gun pointed at them, that is possibly an act of aggression. But does the NAP advocate have to wait until the trigger is pulled before it is definitely aggression? Almost needless to say, it also explicitly prohibits of course utilitarian calculations; a minor redistribution of income from the exceptionally wealthy who would barely notice the loss to a life-saving expenditure to a great number of people whose mortality is certain without such expenditure is explicitly forbidden. 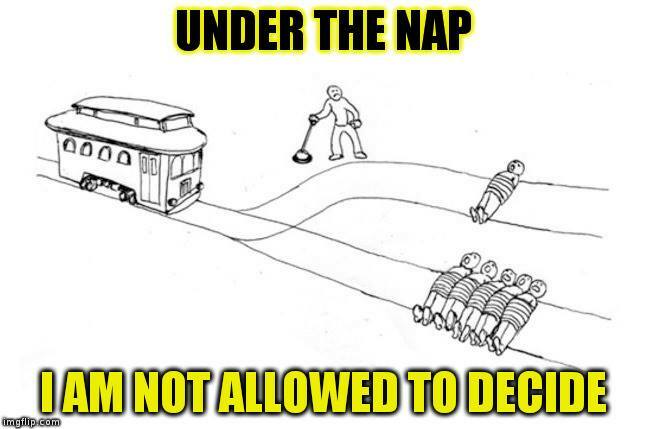 To elaborate from this perhaps the most significant criticism of the NAP however is when one is in a position (c.f., trolley problem graphic)  where all choices cause some harm, or to use NAP terms "initiate violence". When confronted with logical contradictions like this, some NAP advocates argue that to remain consistent with the principles of non-aggression, that no choice should be made - thus ensuring the deaths of multiple individuals rather than taking action that will cause the death of one. Of course, in a sense this avoidance of any responsibility is the "correct" choice from this deontological position, where an ethical grounding in reality is explicitly avoided in favour of abstract rules. This apparently is not a pathology to "principled" NAP advocates. This is not to suggest that principled morals ought to be easily abandoned when in the context of situational ethics. Frances Kamm for example  is one contemporary ethicist which who argues that deontological moral principles provide the foundation and the goal of ethical behaviour which then are then navigated according to situations towards that end with proportionate action, and in doing so incorporates utilitarian and, perhaps accidentially, consequentialist approaches as well (at least in terms of motive or rule consquentialism). In a further sense, pragmatic morals  can also contribute, insofar that it recognises constant improvement in moral theory (something that is often a difficult concept to dogmatic deontologists), incorporates aggregate social utility, and recognises that societal limitations and context to moral action. Instead of principles that are divorced from reality it is better to adopt ethics which are deeply embodied in the reality of contextual circumstances which are also orientated towards the best possible ends with the most principled motivations, with the best use of available information, and with carefully considered proportional action. Deontological approaches with expressed as in absolute are simply impossible and can often lead to worse moral outcomes. Likewise subjectivity of effects and actions must be explicitly rejected except in those cases which are pragmatically subjective. In this way, an increase in liberty - in both the positive and negative sense - can be constantly improved for all, and with the greatest improvements for those who currently suffer the greatest lack. Commenting on this Story will be automatically closed on December 31, 2017. What IS the difference between defensive and aggressive force? Took me a while to actually understand what you were trying to say, but this is actually a question that ancaps have to deal with, just with more honesty. Boiled down, the question becomes: what IS the difference between defensive and aggressive force? The critique is that it’s just "might = right" and whoever has most force gets to set the agenda; the winner says it's defense, while the loser say's it's aggression. You attempt to claim that aggression means all force which we don't agree with, and therefore defensive force is aggression from the other perspective. However, the true position is that aggression is OBJECTIVELY defined, meaning it does not matter how either subject perceives it. You think it's circular because you are stuck in this logic: defensive force = NOT aggressive force and aggressive force = NOT defensive force. But both are oversimplifications. 1st, you need to get the NAP's claim of aggressive force correct. Aggression is the violation of LEGITIMATE property boundaries, not just ANY subjective interpretation of property. That means any logically contradictory or inconsistent conceptions of property are NOT legitimate, aka illegitimate. What is legitimate property? Well, if I said it’s property acquired without aggression, that would be circular, yes, but what makes property legitimate? What establishes property as legitimate in the first place, so that, if violated, constitutes an aggression? Well, the better question would be: what makes it illegitimate? A piece of property is legitimate in its natural state. A person comes to own something by infusing their work or their being with a thing. The concept of Self-Ownership is central and essential to establishing the logic of property ownership. The definition of ownership is the state of possession and/or rightful possession. Possession is defined as the act or state of controlling. No thing is possessed more than a mind. The mind most strongly possesses itself, and then its body, and by extension, the manifestations of the body’s action. That is to say, one owns, or is responsible for, their decisions and actions. So, a legitimate acquisition of property occurs when one comes to control an object through logically consistent methods. If you build something yourself, you have literally fused your choices, actions, and thoughts into a physical object through your work and labor. If you trade this object to another person, they have decided, by their own power to either accept this gift, or give you something else in return. You are transferring the work it took to find and/or make a thing, and trading it for the work of another person. This violates no logic of fundamental ownership. So, we have finding, making, maintaining, gifting, and trading as legitimate ways of acquiring things. A thing that is MADE is more yours than a thing that is merely FOUND, just as the mind is more yours than your body or your things are. That is why, when two property claims clash, or CONTRADICT, we have to look at who has the better claim. Yes, finding a thing, and using work to acquire it IS a legitimate way to get something, however, if that has ALREADY been done to an object, you have introduced the INITIAL contradiction, and if acted upon, will INITIATE FORCE. If you take an object that is ALREADY owned legitimately, you have contradicted the logic of ownership, and it is now ILLEGITIMATELY owned. The NAP says that now, the minimum force used to RESPOND to this action is justified because it is returning the property back to the natural, legitimate state, prior to the INITIATION of force. This is justified because the theft of someone’s LEGITIMATE property is tantamount to the theft of their time and labor, which are parts of themselves. If you want to KILL someone for taking a sandwich from you, this accomplishes two things- it DOES stop the illegitimate theft of food, however, if you can keep or get back the sandwich without killing him, and you decide to kill him as punishment, you are now initiating violence on him. The revenge is a SEPARATE act to maintaining ownership of your sandwich. If you will die without your sandwich, killing as a defensive measure may be justified. A. Let us consider a shelter, owned by me, coveted by you. You would claim that I am using aggressive force on you by preventing you from using it. Let us assume for a moment that there is a rightful owner to the shelter, and my defense of it is because I kicked the rightful owner out. Using the definition of aggressive force as the initiation of force (violence,) the act of preventing the rightful owner from using it is the initial act of violence. In that case, I would be the aggressor. The rightful owner committed no violence of any kind in the creation of this shelter, but I committed violence on him when I took it, thus denying him the time and labor it took for him to make it. If he were to TRADE this shelter to me, WITHOUT violence, and then I prevented YOU from taking it, the initial act of violence would have been YOUR attempt to take it by force. My response, even if using force, is not the INITIAL act. B. Say a man rapes and murders your daughter. Clearly, we can agree that the whole society is at PHYSICAL danger with a person like this running around. This individual WILL take more lives if given the chance. It is a significant risk to have him run around unchecked. We must defend ourselves from this PHYSICAL and IMMINENT threat. He has already acted. So, as an act of self-DEFENSE, we confine him in order to keep him from doing these actions again. Now, we DID violate his freedoms, however, this individual was the FIRST to do it. When you have violated someone’s freedom, this is an inherent contradiction to the idea that all people have equal rights to freedom, therefore, it is justified to STOP this INITIAL violation of freedoms, whether this means locking someone up or killing them, whatever the minimum necessary force is required as a RESPONSE to the initial violation. I appreciate your response to find an objective grounding in property rights and have added it to the original article. As with all political theories explorations into grounded justifications for property claims is the most important foundation. Whilst I could provide a comprehensive response, I will begin with something easy to illustrate the issue. You have argued that "A person comes to own something by infusing their work or their being with a thing". This is essentially Locke's position "Whatsoever then he removes out of the state that nature hath provided, and left it in, he hath mixed his labour with, and joined to it something that is his own, and thereby makes it his property". However Locke rejected any property claim from the commons that was greater than what was needed for sustenance. Further, he included troubling proviso "enough, and as good", which of course, is not possible with economic land which is finite. "[I]t is the value of the improvement, only, and not the earth itself, that is individual property. Every proprietor, therefore, of cultivated lands, owes the community a ground-rent (for I know of no better term to express the idea) for the land which he holds.."
Now it is an objective fact that common land existed a priori to the "infusing their work" (it would not be possible otherwise). It is also an objective fact when land is taken from the finite commons, it does not leave "enough, and as good, left in common". That subtraction would be permanent cost to the commonwealth, and indeed harmful to all others, unless compensation for the exclusive right is provided to the value of what has been taken away.